Custom battery cables are an important component that transfers power from a battery to a starter. These custom made battery cables are used by OEM manufacturers of transportation vehicles, off-road vehicles and generator sets also known as gensets. Custom made battery cables assembly is an integral part of a genset’s starter system. In the case of simple systems, the battery cable assembly is made up of single conducting cable with a connector at each end. But for larger systems, several cables are necessary in order to connect multiple batteries to the starter. The starter is a motor with a gear on the end of its spindle and is used to drive the genset’s main motor in order to get it started. The gas or diesel motor in turn powers the generator used to feed electrical power to a grid or local electrical equipment. Gensets are used as main power sources in areas that do not have access to an established electrical service, or to provide stan d-by power needs in the event of inclement weather, downed lines, blackouts, sub-station malfunctions and grid-wire failures. Hospitals, data centers, and water treatment installations rely on these systems for power in the event of a power failure, to avoid damage to equipment and prevent life threatening situations. In the past, custom made battery cables were manufactured with lead terminals, but these were found to be environmentally destructive and they do not meet environmental current safety material specifications spelled out in RoHS standards. To become RoHS compliant, a Precision Cable Assemblies’ customer required assistance in the re-design of a custom battery cables. 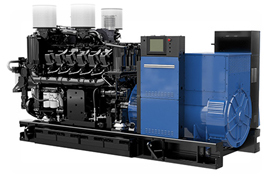 The assembly was to be incorporated into their new series of diesel generator sets designed to operate between 800-4000 kW of power. The design contained lead terminals and a multi-wire assembly that was very elaborate and made initial installation on the assembly line and subsequent maintenance work very difficult. Precision Cable Assemblies provided a practical solution for the custom battery cables. The newly designed assembly incorporated bronze cast terminals which are more conductive than the original lead cast terminals, in turn making the assembly RoHS compliant. Incorporating the bronze provided weight reduction and a mechanically and environmentally superior method compared to the lead.